On March 3, a 21-year-old man landed in the trauma centre of Delhi's All India Institute of Medical Sciences. His leg had been crushed - apart from the gaping wound there were multiple fractures in his right thighbone and kneecap. From the uniform he wore, it was evident that the victim was a pizza delivery boy. Doctors struggled to salvage the damaged limb. For them, this was a familiar story. "On weekends, on an average two or three delivery boys (not necessarily from pizza outlets) land up in the hospital. Most of them have suffered trivial to serious trauma," says a doctor who was on duty that day. In October 2010, residents of a remote village in Andhra Pradesh turned to a local politician who had promised them a 'debt-free' life. In a nearby dhaba, two employees of a Hyderabad-based microfinance outfit were having breakfast. They were scheduled to meet the villagers to offer new loans and receive installments for the existing ones. A mob led by the politician attacked them, causing severe injuries. "One of them had multiple fractures. Both were admitted in hospital," recalls the company's CEO. "It was the first of many such incidents that happened over the next two months." Every day, hundreds of thousands of young men across the country - food delivery boys, couriers, field staff of microfinance companies and, to some extent, radio cab drivers - are coping with work-related risks that can even be life-threatening. Image: On weekends, on an average two or three delivery boys land up at AIIMS in New Delhi. The worst exposed are the food delivery boys. With traffic on the roads worsening by the day, more and more Indians prefer to order a meal home. Eateries - fast food chains, restaurants as well as the neighbourhood dhaba - know this is a good way to expand business, so long as they deliver the food hot and fast. Though most don't set a time limit (the exception is pizza chain Domino's which promises to deliver in half an hour), there is pressure on the delivery boys to be quick; the faster they deliver, the better the business. The need for speed makes them risk limb and life. Domino's maintains that its delivery system and time commitment is borne out of a very scientific design. "Every store can deliver only to areas within 10 minutes' drive time - which is restricted to a radius of about 3km, a standard we follow for all our stores across the country," says Domino's Pizza India Vice-president Harneet Singh Rajpal. "Once we get the order, it is ready for delivery in about 13 minutes. So our delivery boy has 17 minutes to deliver once he leaves the store with customer's order, which includes a buffer of seven minutes for unforeseen traffic conditions. So there is no pressure on them to rush on road." Image: The worst exposed are the food delivery boys. 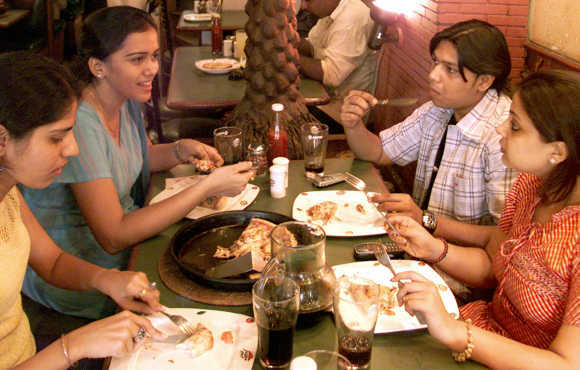 Though in 1993, Domino's did away with the "30 minute or free" guarantee in the US and 35 other countries following some law suits - its owner Tom Monaghan said the step was being taken because of "public perception of reckless driving and irresponsibility" - it continues to offer this guarantee in India. 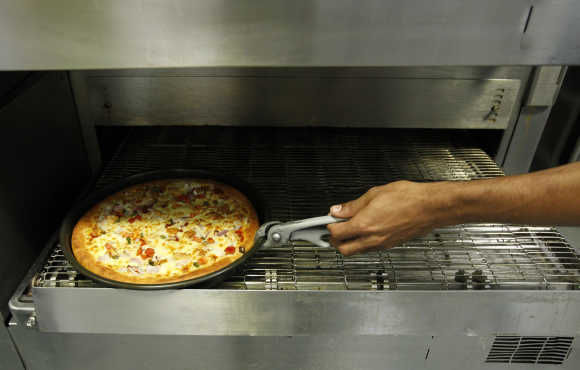 The rush to serve hot pizza cost the company dearly when last year, the Motor Accident Claims Tribunal ordered it to pay Rs 1.15 lakh as compensation after a student of the 10th standard was injured due to the "rash and negligent driving" of its delivery boy. While big companies like Domino's, Pizza Hut, Nirula's and McDonald's never penalise the employees for late delivery - delivery boys confirm this - the smaller ones often do. Rajan Dev, who works with a fast food outlet in East Delhi, says once Rs 300 was deducted from his salary for late delivery. For a man who earns Rs 6,000-8,000 a month, that amounts to more than a full day's salary. "Pressures such as these and the fear of getting scolded publicly make them zigzag through traffic and race against time," says a doctor. Image: Some companies deduct salaries of taxi drivers for reaching destination late. Accident figures are hard to come by. Delhi Police Joint Commissioner (traffic) Satyendra Garg says his office does not keep record of the profession of the accident victim or traffic rule violators. But the cases of delivery boys landing in their hospital have triggered AIIMS to start doing so. "We have started including the profession of the victim in our surveillance questionnaire," says MC Misra, chief of the AIIMS Trauma Centre, "and will be able to show some data in a few months". BS Bindal, the chief casualty medical officer at Sushruta Trauma Center in North Delhi, says delivery boys come with "fractures, head, chest and abdominal injuries". The roadworthiness of the bikes and scooters and the quality of the helmets is also an issue. "The bikes are checked every month and all helmets are ISI-certified," says Nirula's Vice-president (human resources and training) Nitasha Mehta, for which 20 per cent of the business comes through home delivery. Domino's and Pizza Hut say they do not compromise on this front. "We have one mechanic for every three stores," says Rajpal. Pizza Hut-Delivery General Manager Sanjiv Razdan adds that every bike is checked once a shift. However, these checks are seldom carried out by smaller eateries with delivery services. Image: Accident figures are hard to come by. Manoj Pandey, a 24-year-old delivery boy with a small eatery in Delhi's Lajpat Nagar, uses a second-hand bike and a locally-made helmet. There are times when he chooses not to wear the helmet. "I make deliveries within 2km. I don't always need a helmet," he shrugs. His employer too does not insist. A delivery boy employed with a large food chain says that while he always carries his licence, he is not given the necessary registration and pollution check certificates of the bike he rides. "But the police seldom stop and check delivery boys," he adds. And though his bike has a speed governor, which is not supposed to allow him to exceed the 40 kmph speed limit, he says he's able to touch 50 kmph with ease. He's clearly not making this up. We followed a delivery man whose bike is not supposed to let him go over 40 kmph, but he was exceeding that limit by well over 10 kmph. With concerns around delivery boys growing, Pizza Hut has from this year started testing their driving skills before allowing them on the road. One of the other things which delivery companies are taking into account is insurance, though some of the delivery boys say they are yet to get their insurance number. Image: Pressures are real for taxi drivers. However, for delivery boys working for smaller joints, insurance remains a dream. Far from the world of home delivery and fast food, in the villages of Andhra Pradesh, Tamil Nadu, Karnataka and Bihar, the foot soldiers of microfinance companies are also risking their lives to make a living. Carrying large amounts of cash in remote areas and with little protection, they have always been targets of robbers. But of late, a new threat has emerged - villagers determined not to repay their loans. 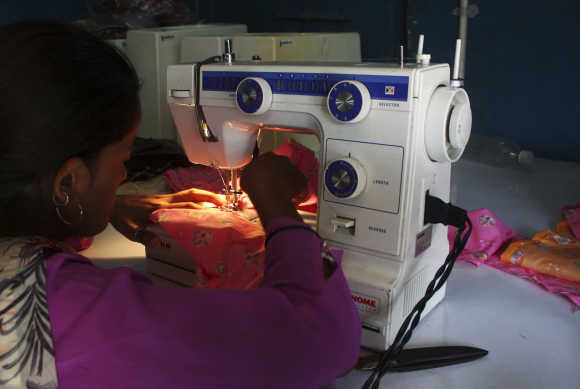 Aware of the risks their field staff deals with, large microfinance companies now take life and health insurance cover of around Rs 100,000 for their agents. The chief executive of a microfinance company says that during their training, the agents are also told not to take any risk in the event of a robbery. Before the microfinance crisis hit Andhra Pradesh in October 2010, the state held one-third, and the largest, share of the market. There were 45,000-50,000 field workers across the country. The number has since fallen to 32,000 due to two factors: one, with business in the doldrums, the incentive has come down; and two, there is the fear of being robbed, beaten or arrested. 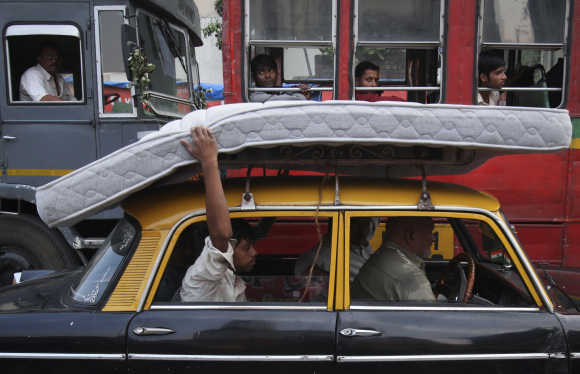 Image: Women taxi drivers in Mumbai. Two years ago, an employee of a microfinance company was attacked and killed by robbers in Karnataka's Shimoga district. He was on his way to offer fresh loans to the villagers and was evidently carrying a sizeable amount of cash. For young men, aged 20-25, coming from poor families and educated only till the 12th standard, this is a big price to pay for a meager salary of Rs 6,000-8,000 per month. Speaking on the condition of anonymity, for fear of a political backlash, microfinance leaders admit that for their field staff in Andhra Pradesh the job has never been this dangerous. The chief financial officer of one Secun-derabad-based micro-lender says recently a villager invited one of his employees to his house promising to repay the loans. "When he went there, they locked him up in a room and called the local politician and the police. He was arrested, apparently for trying to recover money from the villager illegally," the executive says. Micro-lenders say that ever since the sector plunged into a crisis, instances of field staff getting arrested by the police or beaten by the public have increased significantly. "It is difficult to put a number to it. 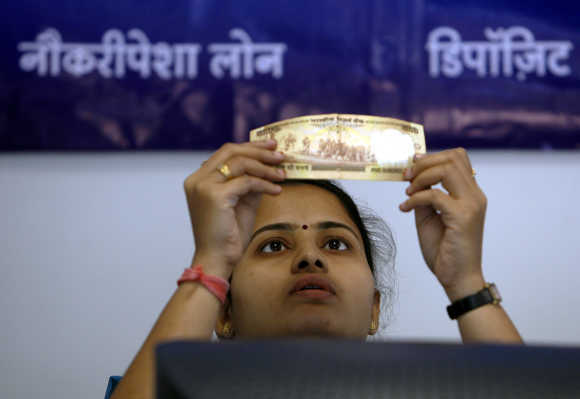 There are numerous instances," says the chairman of a Hyderabad-based microfinance company. 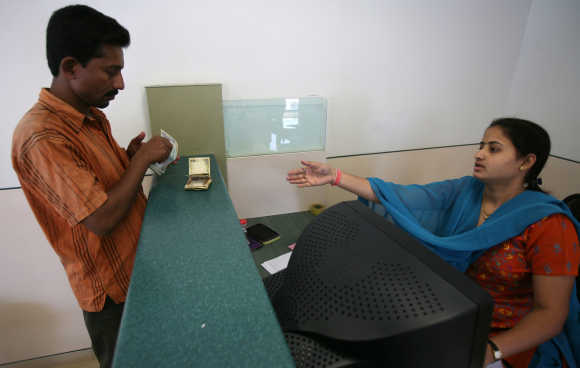 Image: Microfinance agents face fear of being robbed, beaten or arrested. The risk that drivers of radio cabs are exposed to is somewhat different. Most of them have to pay a daily cut (of up to Rs 1,500) to the radio cab agency that provides them business, and they have to foot their own fuel expenses. If they want to own the cab they drive, they also have to make a hefty down payment. High turnaround thus becomes very necessary. 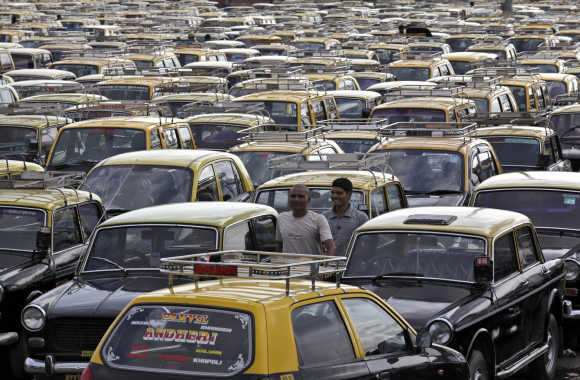 For the cab drivers of Bangalore, where traffic is a nightmare, the pressures can be real. 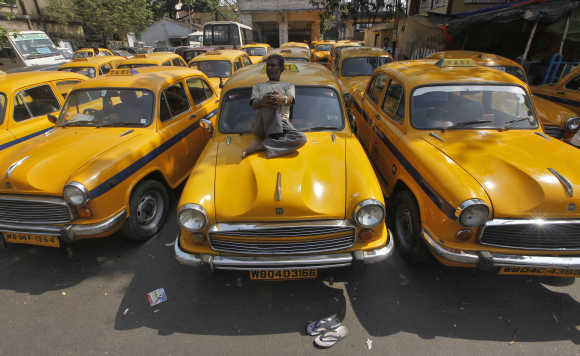 Chandrasekhar, the proprietor of local taxi company Quick Cabs which has a fleet of 120 cars, says if the driver does not reach the destination on time, he has to give the customer a discount of Rs 100 which is deducted from his salary. Quick Cabs driver Balaji S adds that if a customer, annoyed with a tardy chauffeur, either pays him less or lodges a complaint against him, again money is deducted from his salary. The rule might tempt the driver to overspeed, but if he is caught doing so while on duty he has to pay a fine. Balaji recently had to fork out Rs 300 as penalty for speeding on his way to the airport, which went from his fixed monthly salary of Rs 7,500 (excluding daily expense on long trips). He says fortunately he has not met with any accident while on duty. Image: An employee of a microfinance company was attacked and killed by robbers. Sakshi Vij, the head of marketing at Carzonrent, the largest car rental company with 6,500 vehicles under the Easy Cab brand, denies any extra pressure on drivers. "All cars are tracked with GPS, and it is the chauffeur who is closest to the destination and available for duty is sent," she says. If the GPS tracking shows that a driver is speeding, a message is sent to him to slow down. If he does not, the company calls the customer and tells him to ask the chauffeur to slow down. "Even if the customer happens to be in a hurry, we tell them this is for their own safety," says Vij. The company, she adds, has not had any major accident so far, "touch wood". Image: Cases of microfinance field staff getting arrested have risen.